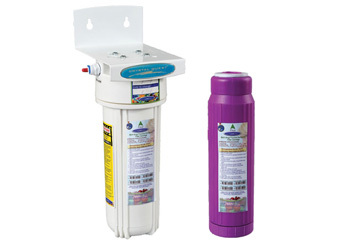 The Inline Nitrate Removal Water Filter contains a special nitrate-selective resin. Nitrate reduction is 90% to 95% and breakthrough is not affected by sulfate levels. The capacity is 3000 ppm of nitrates as CaCO3. To determine capacity, first calculate the ppm of nitrates as CaCO3, then divide that number into 3000 to get the gallons. This cartridge can be regenerated using sodium chloride brine. Nitrates(NO3), are commonly used as fertilizer for agricultural industries. It comes into water supplies through the nitrogen cycle rather than via dissolved minerals. It is one of the major ions in natural waters. Most nitrate that occurs in drinking water is the result of contamination of ground water supplies by septic systems, feed lots, and agricultural fertilizers. Infants below six months who drink water containing nitrate in excess of the MCL or maximum contaminant level (US EPA's MCL for nitrate is 10 mg/l) will experience a reduced oxygen-carrying capacity of the blood(cyanosis) and could become seriously ill and, if untreated, may die. This could also cause a disease called methemoglobinemia, or “blue baby” syndrome with other symptoms including shortness of breath. Unlike coliform or other types of bacteria, boiling the water will actually INCREASE the amount of nitrate remaining in the water, increasing the danger to infants. 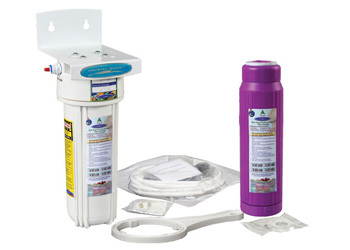 If you have high levels of nitrate in your water, treat the water with a specialty FilterWater.com's recommended Nitrate Water Filter system by Crystal Quest or find another water source; boiling will only make it worse! Easy to install, convenient and effective. 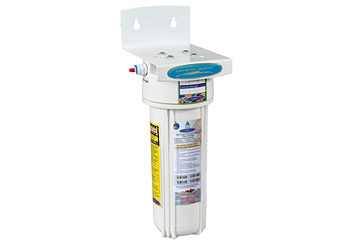 This Inline Water Filter is installed on the water line that is connected to your fridge and can be used with almost any refrigerator brand. 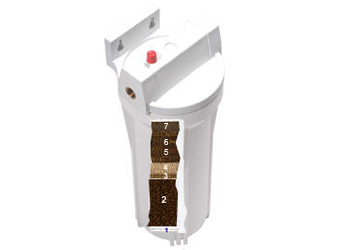 It is designed for use on refrigerators with ice-makers and/or water through the door and can also be used with water fountains, water coolers, commercial coffee makers and ice machines. High-pressure quick-connect fittings can be used on either 1/4" o.d. copper or plastic tubing. 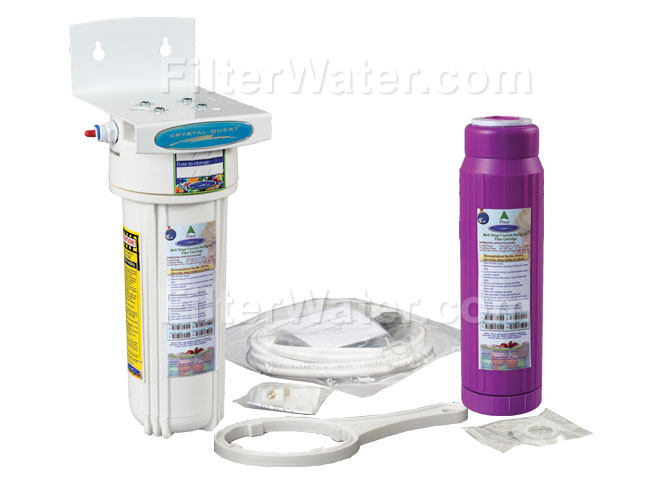 6-Stage filtration process plus Nitrate Removal. Coconut Shell Carbon or Granulated Activated Carbon to rid cancer linked chemicals. Nitrate filtration capacity is 5500 at a 90% to 95% reduction.